Identify items and equipment in need of service. 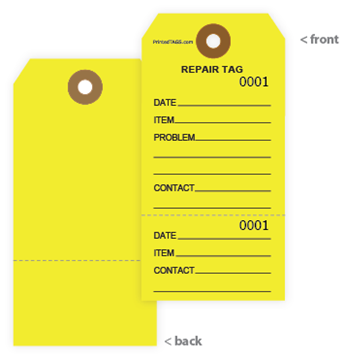 Repair Tags track repairs and eliminate safety issues within work spaces. Our Repair Tags are available in yellow or red tag stock, featuring tear-off stubs numbered with bold ink. One part stays with the item for repair and the other with the owner or proper department.